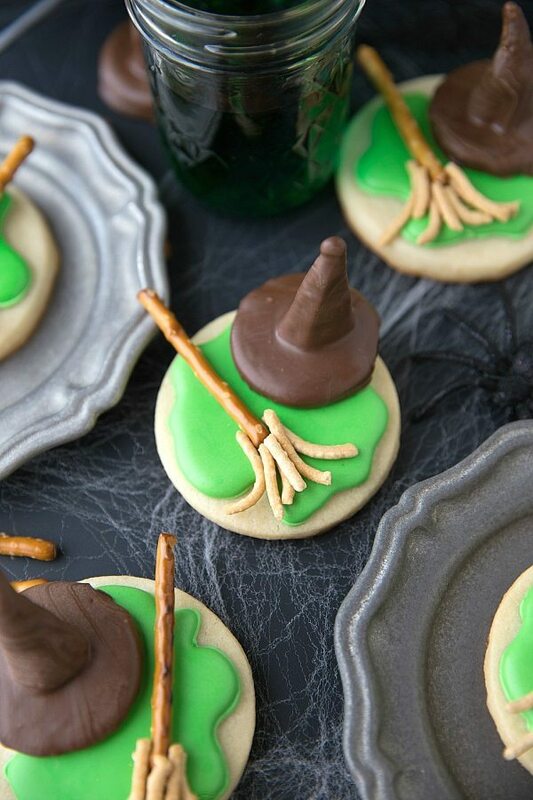 Adorable sugar cookies decorated to look like the melted wicked witch! The perfect Halloween dessert. So I tried out for Dorothy. An important note here: the play was a musical and I do have a singing voice that is maybe a step up from that of a frog. If you think I’m exaggerating here, you should ask my husband. My husband tells me I’m good at everything whether it’s true or not. But singing? He’s not afraid to tell me that is not even close to being one of my talents. Anyways, we were able to try out for as many parts as we wanted, but I only tried out for Dorothy. And guess what? I didn’t get the part. But wait. Even better than that, I got a part that I didn’t even try out for — the wicked witch. Conveniently the ONLY part that didn’t require any sort of singing for a play that had to include everyone. Haha. So the acting gig didn’t quite work out, but I did learn that I’m quite obsessed with everything “witch.” Although I couldn’t wear sparkly red shoes, I loved painting my face green and wearing the witch costume. I loved the cackle, the broom, and most especially, I loved the scene where I was “melted” by Dorothy’s pail of water. So, for the inspiration of these cookies! Sometime last year around Christmas time, I saw some of the cutest sugar cookies. They are melted snowman cookies…perhaps you’ve seen them? 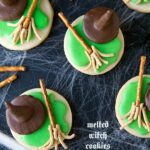 Sometime after seeing them I had Halloween on my mind and, with my total love for witches, I thought – how fun would it be to have a melted wicked witch cookie?! I thought the idea was pure genius and got so excited about it. 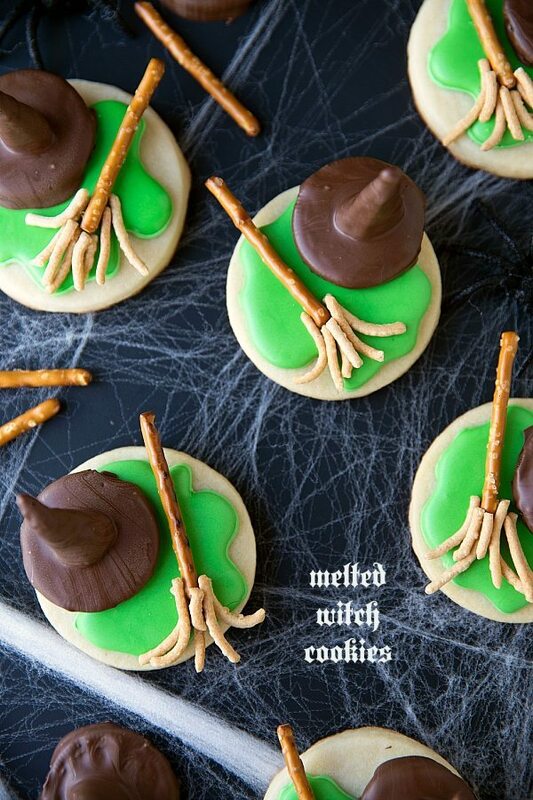 I wrote it on my plans to do and have anxiously awaited Halloween now for months 🙂 But sometime between the time I thought of the idea and actually executed it, I saw another version of melted witch cookies online. I was sad to learn my idea was not 100% original. Turns out people have been more creative than me for a while since there are quite a few versions of these cookies 🙂 But I couldn’t NOT post these after being so excited…so here is my take on melted witch cookies! If royal icing intimidates you, these will be just fine with green-dyed frosting. If you smooth it over the cookie to look like a puddle, it will work out great! It also works to use frosting to attach the hat and witch broom. In between two sheets of plastic wrap or wax paper, roll out the dough to about 1/2" thickness. Cut out the cookies and place on a parchment or silicone lined tray. Either pipe and flood (using royal icing) or frost (using regular frosting) a "puddle" shape onto each cookie and let it dry completely. Using leftover royal icing or frosting, attach a pretzel stick to one side of the cookie. Carefully piece each chow mein noodle to the bottom end of the pretzel to look like the base of the broom. Again, use the royal icing to attach the chow mein noodles. 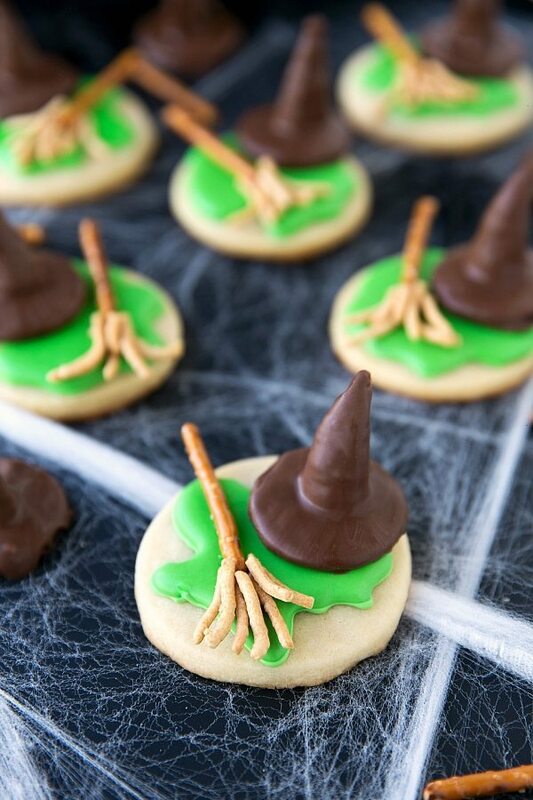 While waiting for the puddle on the cookies to dry (if you did royal icing), make the witch hats. In a small microwave safe bowl, combine the chocolate chips and the vegetable oil. Microwave in bursts of 15 seconds stirring for 15 seconds in between each burst until the chocolate is melted. Using dipping tools or a fork to help you, dip the bugle in the chocolate and shake off the excess chocolate. Separate an oreo cookie and remove the frosting. Dip one of the cookie sides in the chocolate and attach the chocolate-covered bugle to the now chocolate covered cookie. Set on a cookie sheet lined with parchment paper to allow to set up. Attach using leftover frosting or royal icing. Easy Halloween Oreo Balls – Spiders! Mummy Milanos – the easiest Halloween treat! Haha! I love that. You may not be able to sing (neither can it–it’s so, so bad) but you CAN bake adorably delicious Halloween cookies! These are the cutest. Adorable! And on that note… How is your new little guy? Another awesome Halloween treat! These cookies are the cutest! These are just the cutest cookies, Chelsea! I would love to serve these at a Halloween party or get-together. Love your creativity! Oh my gosh Chelsea these are just too darn cute!! How fun!! haha oh man I went thru so many phases when I was a kid about what I wanted to be! lol awww I bet you did a great job as the witch-that would’ve been fun to play! and these cookies are the cutest, you’re so amazing at making halloween themed treats!! !